As many of you know, my family and I are expecting baby number three in just a few short weeks. As I take some time off from work and blogging to spend time with my family both before and after my new son’s birth, I am thrilled to share with you some amazing posts written by some very talented bloggers. So please sit back, relax and enjoy this guest post and leave a comment letting us know what you think! Today fellow SLP Felice from The Dabbling Speechie joins us to share some tips for getting late talkers talking! Greetings from The Dabbling Speechie! I am here today to share some of the techniques that I found to be helpful with getting those little ones who are late talkers to start using words to communicate. When my 4 year old was an infant, I worked part time at a private practice with children 18 months to 2 ½ years of age. I loved working with this population because I was able to work alongside parents teaching them how to facilitate communication in the home setting. 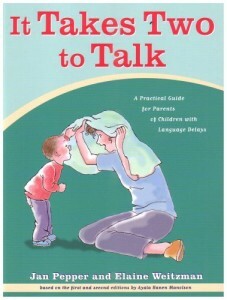 As an SLP, I used many of the principles and tricks from the book It Takes Two To Talk by Jan Pepper & Elaine Weitzman to show my parents how they could contribute to their child’s language development throughout the week outside the therapy room. Many moons ago, I went to a session at the California Speech and Hearing Association Conference on The Hanen Program’s Target Word program and LOVED it! I had several clients who fit the criteria for being a late talker that were under the age of 30 months who presented with typical social skills, had good receptive language abilities, average play and turn taking skills and were attempting to communicate messages, but only had on average 5-10 verbal words. By 24 months, your child should be starting to put together 2 word phrases and have a vocabulary of around 150-300 words. 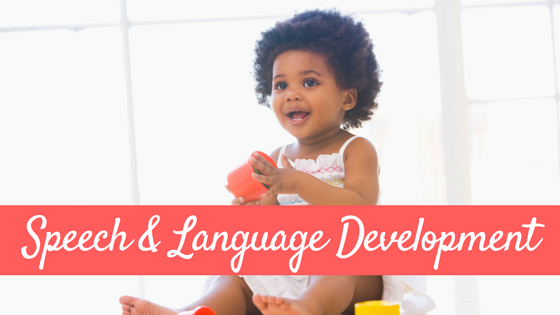 Check out ASHA to see the speech and language developmental milestones for young children. 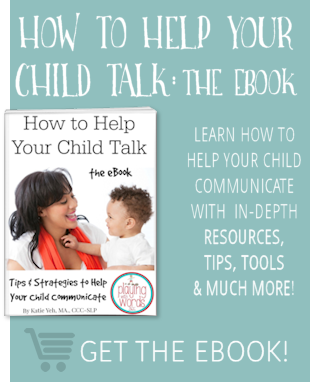 If you feel your child may fit the late talker criteria, consider contacting an SLP in your area or attending the Target Word Workshop to gain more techniques to help your child. The idea behind the Target Word program is to build language learning opportunities into everyday routines by picking “target” words that occur frequently throughout the day. So, essentially, you are going to be picking 3-5 words that you will be highlighting throughout the day. You want to pick words that will used frequently throughout the day, hold a lot of meaning for the child and words that can be paired with a gesture, such as “up” because you can lift your arms in the air while you say the word. The program also talks about using “verbs” over “nouns” because verbs can be used in a variety of ways whereas using a noun such as “chips” can only be requested during snack time. We ideally want our little ones to start stringing together two words together, so it is much easier to build two word phrases from verbs. 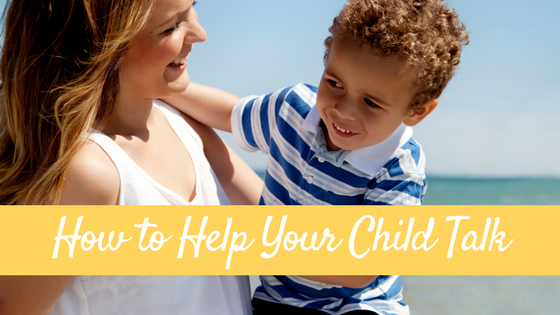 For example, once your child can “up”, then can then start pairing up with other words they may know such as “up daddy”, “up chair”, “up plane” or “up please”. 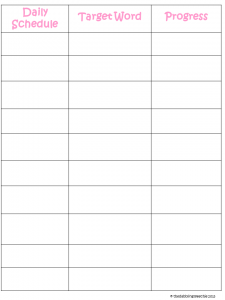 I created a template for recording times throughout the day when parents can use the target words chosen throughout the week. 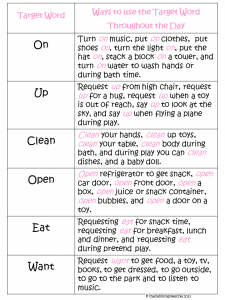 As you highlight the word such as “up” or “eat”, you can pair it with a gesture, so that if the child is not able to say the target word yet, he/she can still communicate the word with a gesture. There is also a spot on the worksheet for the parent to document whether the child used a gesture, a word approximation and if the child initiated the word or needed a visual or verbal prompt. The parent can also keep data for how many times during that scheduled period the child said the target word. So, during breakfast, you can document that the child said “eat” five times while requesting eggs and cheerios. 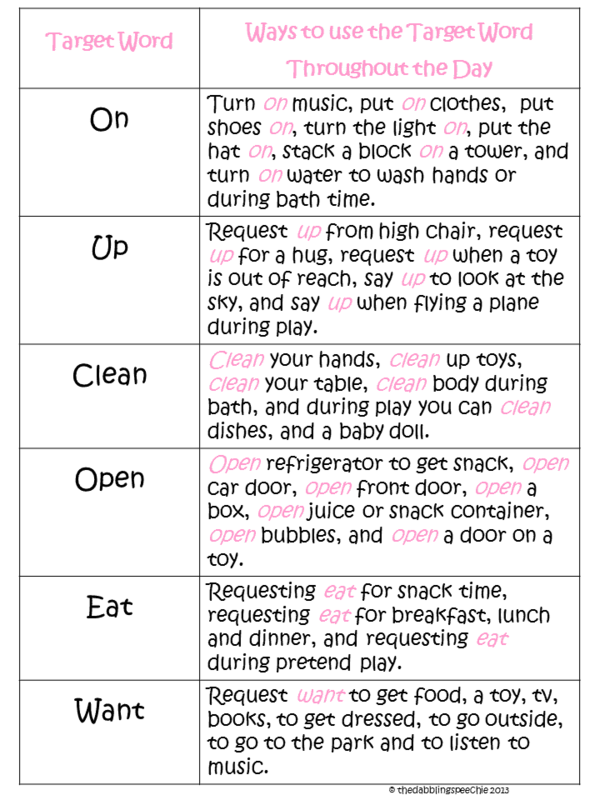 As SLP’s we can sit down with the parents at the end of the session and plan out what target words and activities would be good for the week using this worksheet. 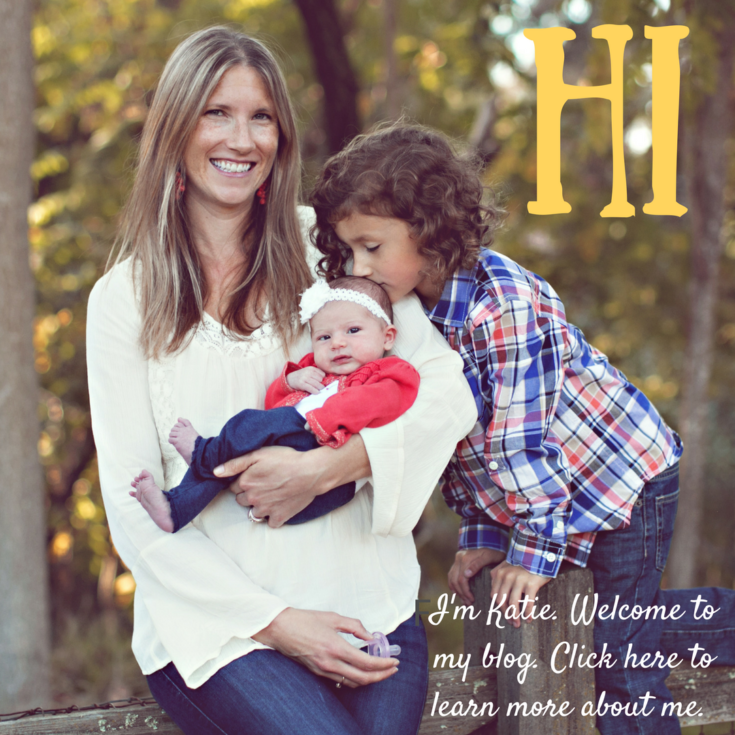 I hope you enjoyed my post today and now have some new tricks for working with those little ones! Thanks for having me Katie!! Felice Clark is an ASHA certified school based clinician that currently works Sacramento, CA. Felice received her master’s degree at California State University Sacramento and has been a licensed Speech Pathology since January 2007. She has experiencing working with birth-3 year, elementary, junior high and high school students, but currently works with K-8th grade students. Felice has a passion for working with students on the autism spectrum and doing language therapy. She is the author of a speech and language blog called The Dabbling Speechie and you can also check her out on facebook. Thanks so much for this. I am a developmental therapist and I am implementing aspects of the target word idea with some of my kids on the spectrum. This was a helpful post! Thank you for this wonderful information. 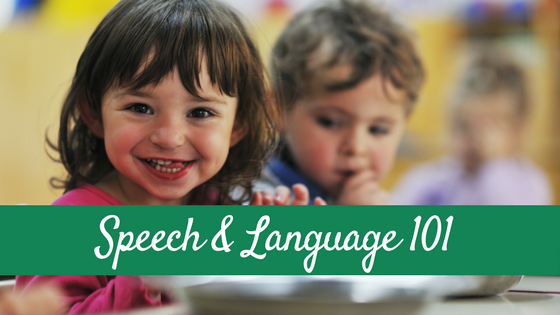 I am an SLP who mainly works pre-k – 12 DHH. I recently started working a second job where I have a heavy caseload of delayed talkers, targeting speech/language with this age and no hearing loss is totally different and I was stressed about how to service him. You have given me a wonderful place to start! Thanks! Thank you for the help. My daughter is a little late at talking, so we are trying to help her with some speech therapy. I like the target word idea that you shared. Her vocabulary is very small right now. I would love to help her learn more. Thanks again. Thanks for these speech language tips. My son is almost three years old, and he hasn’t started speaking more than two words yet. Your tips for using these target words every day will help improve his speaking abilities. The word ‘up’ isn’t commonly used in my house, so it’s helpful that you posted examples when speaking to my son. Requesting up from his high chair seems like something that we can use every day. I’ll work on that when teaching my son to speak. 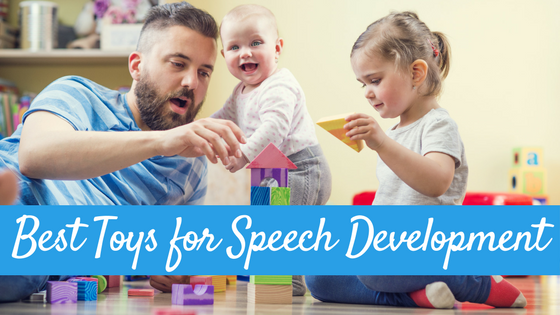 I like the idea to use target word to help your child to learn important speech patterns and vocabulary. My sin has been struggling to speak recently and I think that he may have an impediment. I think that I should find a speech therapist that could best understand his learning curve.